I was sitting in the hospital waiting room waiting for my name to be called to get blood work done on Wednesday. I was looking around at the other people sitting in the waiting room wondering what their stories were. I have learned over the years that everyone has a story. There was someone that caught my eye. She was a woman around my age and she looked petrified. She was all alone and I felt bad for her. I tried to give her a reassuring smile from across the room but I know it wasn’t helpful. I don’t like getting blood test myself. Growing up, whenever I had to get shots or blood work I would pass out but fortunately as I got older I have been able to handle it better. I still don’t like it but I don’t pass out anymore. Later when I was called in I heard this woman ask if she could have the booth where she could lie down to have her blood drawn. I wanted to volunteer to sit with her. I know how that feels. Sometimes you just can’t control how your body reacts to situations. I am working really hard to appreciate life and pay closer attention to the “small moments” in my life. Sometimes it is harder than I thought to find “small moments” in my day. But today I was telling myself that things could be worse. People were getting pre-op tests done, coming out of the hospital in wheelchairs, there were going to be people leaving the hospital today having just lost a loved one. My story isn’t that tragic. My health issues will be figured out and I will continue on. 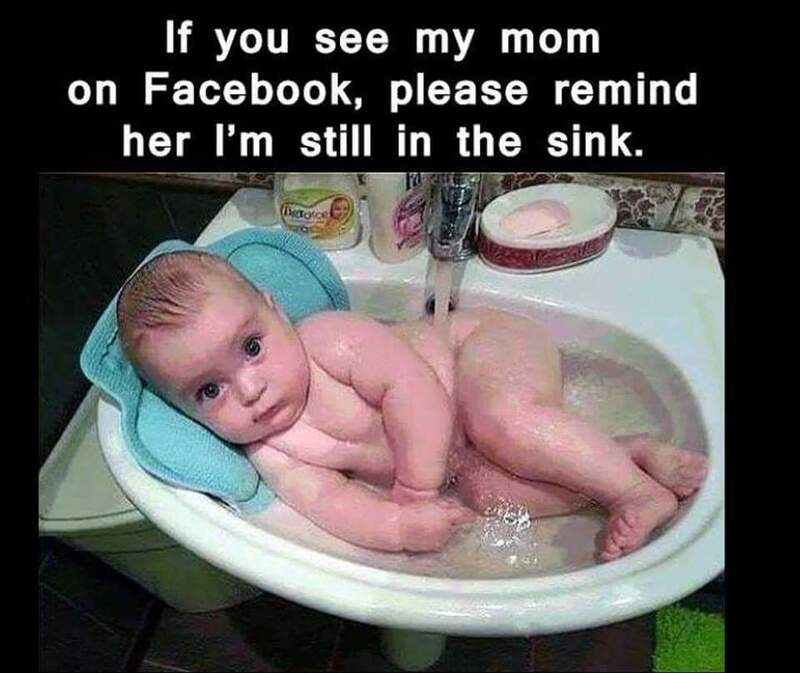 I was sitting there in the waiting room looking through my emails from work and checking my Facebook page when I came across this picture up above of a baby in the sink and I had to laugh. It was exactly what I needed to lighten the mood around me. I couldn’t stop looking at the picture after I read the baby’s comment. That face is priceless. I thought it was the cutest thing. You may not think it is that funny but maybe it was one of those times when someone says to you, “You just had to be there.” But I hope that it made you smile at least a little today. And your story wasn’t as scary as some of the people I saw at the hospital today. Here’s to finding those “small moments” in our day! Sometimes in the strangest places! This entry was posted in appreciating life, appreciation, health, life, smile and tagged appreciate life, blood tests, finding hope, health issues, hospitals, scary situations, small moments. Bookmark the permalink.